All the graffiti removal power of EzyClean Blue in a handy pocket sized 125g aerosol can. CFC Free! Spray it on, wipe it off… and the graffiti is gone! Perfect for Council Teams and for Community Groups working in ‘Open Space’ or on signage. Easy to carry, hold and use over prolong..
For rapid graffiti removal when time is of the essence. Convenient 750ml Trigger Bottle! 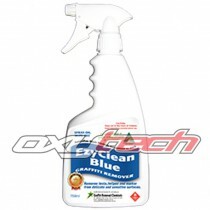 Get the same great EzyClean Blue graffiti removal power with a simple squeeze of the trigger. Target the graffiti, squeeze the trigger, wipe the graffiti away. Ezy as! Ideal for removing felt p.. Convenient 750ml Trigger Bottle - Perfect for when an EzyWipe is just not enough. No Odour. Spray it on and wipe it off. No clean up required afterwards. Removes texta, markers, felt pen and spray paint from concrete, painted surfaces and other sensitive surfaces. 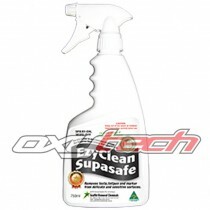 Ideal for high..
Supasafe EzyWipes - Meets Australian Government Non Dangerous Goods Criteria. Non Flammable, Non Corrosive No Toxic odours. Ideal for high public traffic areas. The Ultimate Whiteboard cleaner. Will even remove accidental use of non magic markers. Graffiti Ezywipes and Supasafe Ezywipes .. Convenient and quick removal of texta, marker, feltpen and spay paint from play equipment, signs and painted surfaces. Graffiti EzyWipes - A durable and strong pre-moistened towelettes impregnated with a pleasant smelling citrus chemical to ”wipe-on and wipe-off“ graffiti from signs, painted s..